The Wildflower Olympic race on Sunday was my first “real” triathlon, and the hilly course, oppressive heat, and less-than-sound sleep spent camping prior to the race plunged me headfirst into the world of triathlon. 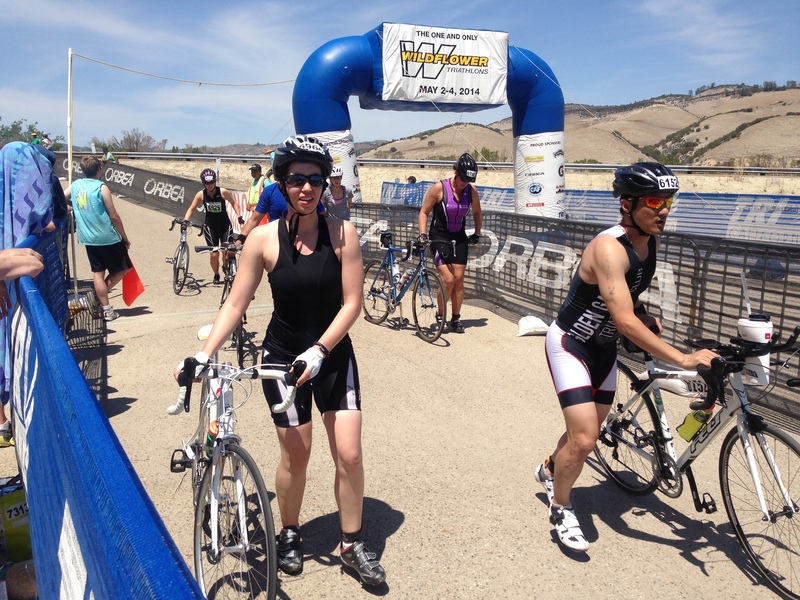 Confession: a few weeks before Wildflower, I seriously considered not doing it due to my fear of the bike. However, I changed my mind a few days later and decided to use the race as a benchmark against how I could fare for Vineman. I did the course completely “naked” without the use of any watches: my number one goal for this race was not a time but to effectively manage my emotions and emerge feeling triumphant instead of defeated. After an initial freak out in the water that slowed down my swim time by maybe five minutes, I foolishly attempted to “make up” this time by spending less time than I should have in transition. 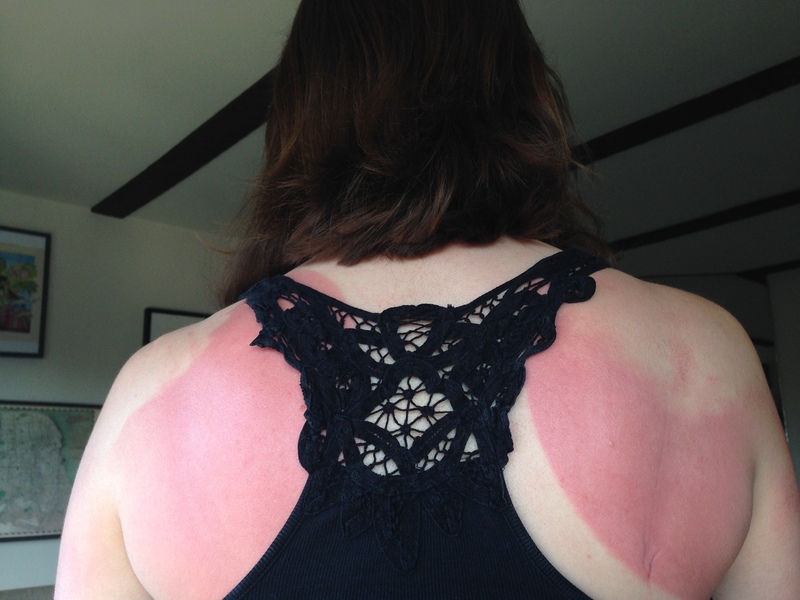 While my first Olympic triathlon went as well as it could have on this brutally hilly course with no shade from the sun, I paid dearly for trying to catch up with the pack: I have the worst sunburn in recent memory on my back from haphazard sunscreen application. After finishing the race, I realized that I had been foolish in trying to catch up to the pack: the people who choose to race Wildflower are generally seasoned triathletes who are looking to challenge themselves with this difficult race. Although I may return to Wildflower, I’m not totally defeated by triathlon and learned what mistakes I wouldn’t repeat next time. While Jesse raced the brutal long course, I spent my time reading, spectating, waiting for Jesse at transition and at the finish line, and watching Jesse Thomas four-peat. When Jesse stopped at transition between the bike and the run, I was worried. He looked disoriented and overheated, and when he said he was thinking of taking a DNF, I encouraged him to do what he felt was right. He eventually pulled through and started walking, and I was stoked to see him finish strong 11 miles later. During the day, I tried to stay in the shade as much as possible and stay off my feet. I emerged without a sunburn, but I clocked 22,000 steps according to my Jawbone, which is definitely more than I’d like to move the day before a big race. After getting off the shuttle, I set up my transition area and waited around for almost an hour and a half. The first wave started at 9:00am, while my age group didn’t start until 10:20. Jesse was kind enough to hang out with me before the start and helped me put my wetsuit on around 10:00am after we walked down the ramp toward the start. When he tried to zip me up, we realized we had a problem: the zipper was broken. Jesse tried to fix it, but unfortunately, there was nothing he could do. I rushed down to the water to join my age group and had about 30 seconds before the gun went off. When I entered the water, I freaked out. My chest was heaving, and I couldn’t calm down and breathe. I did breast stroke because I couldn’t control my breathing enough to submerge my head in the water to freestyle swim. 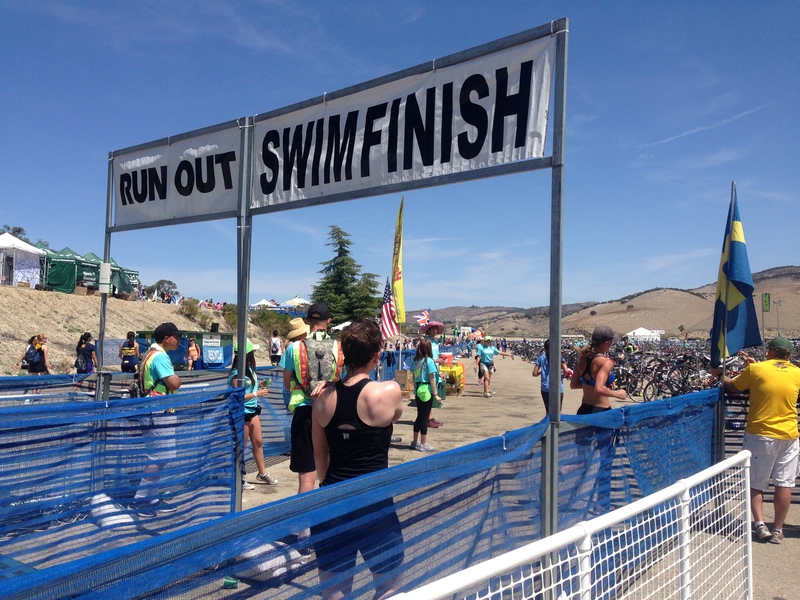 About one-third of the way through the swim portion, I started getting a rhythm and could freestyle swim again, although I was very defeated that most of my yellow-capped women in my age group were substantially faster than my breast stroke and flail method had proved. I vowed to make up this time in the transition and on the run and bike legs. These shoulders would soon be fried. 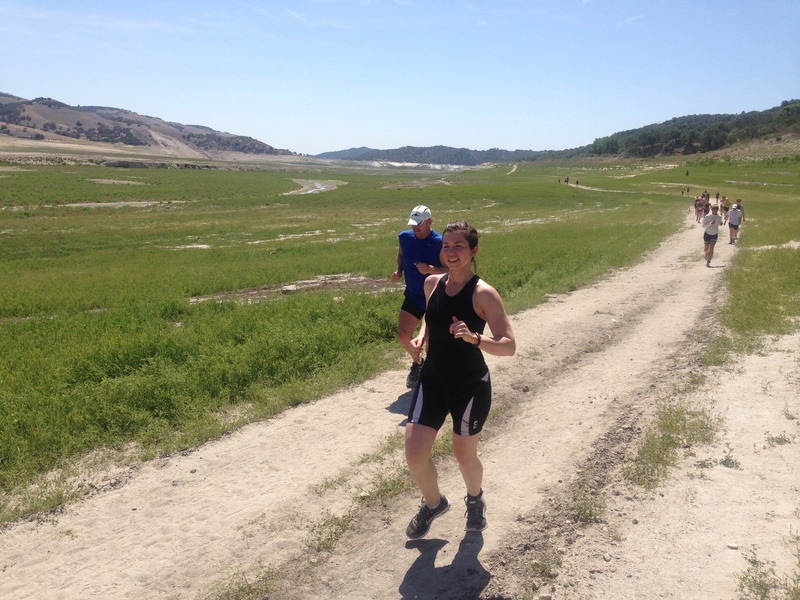 After feeling initially quite wobbly when walking up the ramp to my transition area, I found my running legs quickly and ran the (mostly downhill) 2.2-mile segment along the dry lake bed. Jesse met me along the way, and I was so happy to see his friendly face after the swim left me feeling a bit defeated and left behind. Happy to see Jesse before the bike. The bike was my most dreaded leg, but it went surprisingly well. After being warned repeatedly to start on my lowest gear to climb the dreaded mile-long Lynch Hill, I ended up passing people on the climb and emerged much more confident for the rest of the race. The bike leg was brutal: you’d think you’d be done climbing for a while only to climb another substantial hill. I’m proud that I never stopped to walk up any hill and that I didn’t crash. Although it wasn’t the fastest bike ride, I’m happy that I managed my anxiety as well as I did on this leg of the race, even on the downhills. Done with the bike, so stoked. After seeing Jesse at the bike in area of transition, I was so excited to run four miles and be done with this race. The run was not too eventful. After a brief segment running toward the swim area, we were taken up a long, not runnable hill where I hiked up and chatted with another race participant. Upon reaching the top of Lynch Hill again, I took off, racing the last mile with the last fuel in my tank and passing as many people as I could. I finished in 4:13, ranking me low in my age group (98/119), but looking at the other girls’ times, I would suspect that the majority of them have raced an Olympic or Wildflower before. The real triumph for me is not in my time but how I handled the bike, the fact that I didn’t bonk, and the chance to practice my fueling strategy for other races. While I’m registered for Vineman in July, the heat at Wildflower has me second guessing whether I should consent to do another race where 90 degree temperatures are a distinct possibility. I’m not going to make that decision immediately (I need my sunburn to heal first), and I may try to change my registration to Oceanside next March instead, where cool temperatures and fog are almost guaranteed. Ouch! Heal quick. Tell Jesse I said to man up and jump the rope to get your sunscreen right! That sunburn is amazing! Feel better and great job with the race! thank you! it is amazingly bad! Ouch!! I hope the sunburn heals quickly! But great job on taking on your first Olympic, you did awesome! Oh Wow! 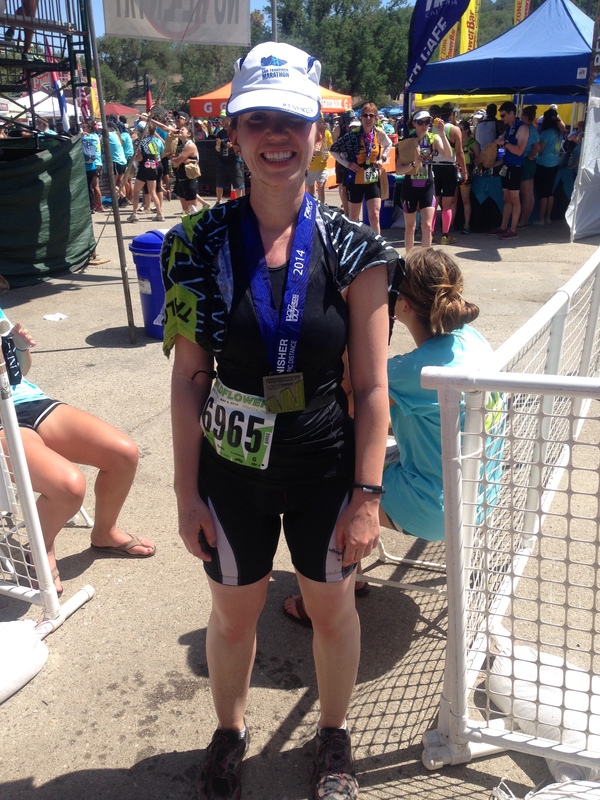 Congrats on finishing your first real triathlon! Huge Props to you! I am inspired to do a triathlon now. I am working on it, just need to learn to swim first! And good luck battling through that tough sunburn over the next week or so. That might be worse than the race itself! I think you’re right! It hurts so badly. And can’t wait to hear about your triathlon journey! 🙂 It’s a lot easier when you break everything out in parts. Congrats! 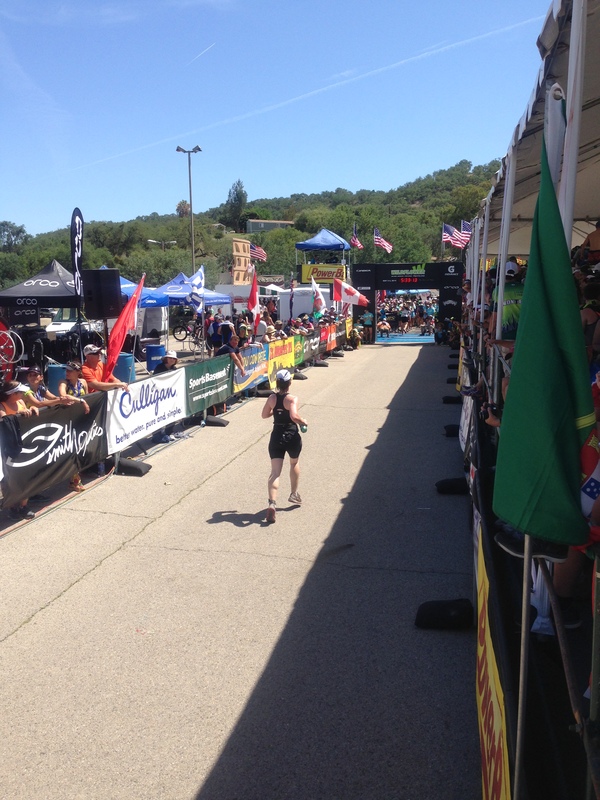 Wildflower is definitely a tough first (or first “real”) tri, and managing the conditions — and your attitude! — is as much of a sport as any of the three race disciplines! I was also really worried about the heat at Vineman, but I think the earlier start times keep it manageable, at least till the end of the bike. Last year we got lucky with the weather and the run wasn’t so bad either! Thank you for your kind and encouraging words! I am definitely a little worried about Vineman, but the start time is definitely better than my 10:20 start time at Wildflower. Yay, congrats!!! Are all your races there on trails? I’m so used to pavement races. Again, way to go, I have yet to do a tri. It’s on my to do list though. Good luck with sunburn! I did the long course on Saturday and for the first time in my 4 years of triathlon, ended up with a crazy burn. I think that this race was particularly challenging because there wasn’t much time to acclimate to the heat. 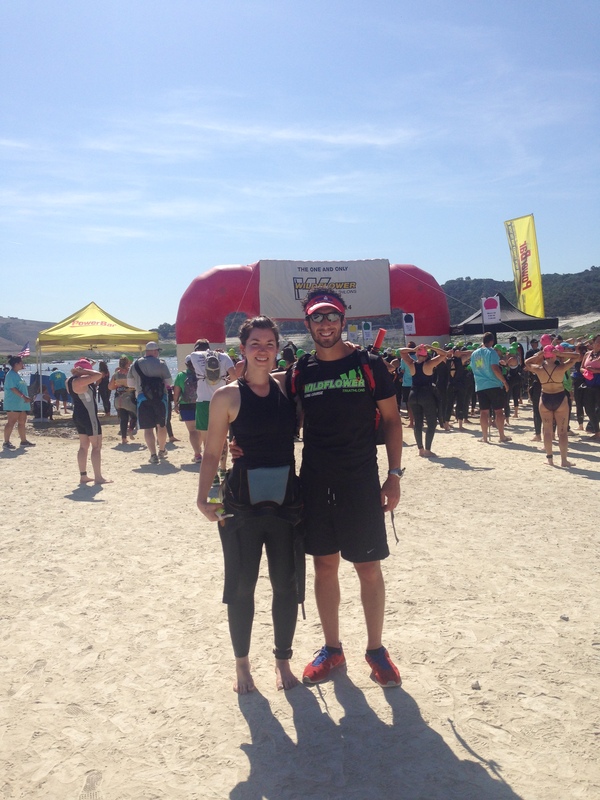 I did Vineman last summer and definitely had some hot training rides and runs which helped me – both mentally and physically! That sunburn is almost frightening!! Awesome job on the race! Noxema, really? I may have to try that. OH NO about the sunburn, that looks aweful! (sorry). I think as tough as this race was for you, as the days go by you will be more able to appreciate it as a “good” experience for your next triathlon, whenever that may be. First races of any kind are tough, especially one that is considered a hard race to begin with… I think you did great! Congratulations! I think you’re totally right – with distance I can begin to appreciate it for what it was. Thank you! 1) YOU SUNBURN! I just want to buy you aloe and ask you if you’re ok! I’m always impressed by the triathlon. Maybe one day in my future I’ll give it a whirl, but until then, I’m infinitely impressed by you! 1. It hurts SO BAD! You did it! Congratulations!! I hope that sunburn heals soon, looks soo painful! Thanks! It is really quite painful. Awesome job on the bike and your first “real” tri! You rocked it girl! Way to overcome your fears. Awesome job on this super brutal course! I have only done the long course but I know the oly is just as hard and to be your first OLY? (right?)!! Congrats! I have wanted to do Vineman for a while but am also afraid of the heat! !